Surfing and travelling with a dog in tow for years has opened our eyes to the beauty of hiking, running and exploring beyond the surf spots. So, best let the dog do the talking when reviewing a product that helps us explore more. I love her. She loves me. We love her shoes equally. “I’m not a hiker, I’m not a runner. I’m Bonzer, a four-legged girl with a long tail. I love to hop, skip, walk, jump and sprint while I’m out and about in the woods, on the beach, over the hills and exploring new paths. And I love that my lady takes the lead and joins the fun. It’s how we discover places, see new horizons and different perspectives. It’s how she clears her mind, and I get mine busy chasing leaves and dragonflies. After years of my lady wearing all kinds of shoes – trying new stuff, second-hand stuff and putting on any old stuff – finally she’s got the right gear on her feet. It’s all in the footwork. Shoes that she feels light in, flexible, so she can join me in the hop-skip-sprint-jump-sometimes slow down and just walk fun. Shoes that, just like me, don’t mind getting dirty and wet, but still look pretty cool and ladylike. Our favourite trails along or near the seaside you’ll find in our I Love the Seaside Surf & Travel Guide. 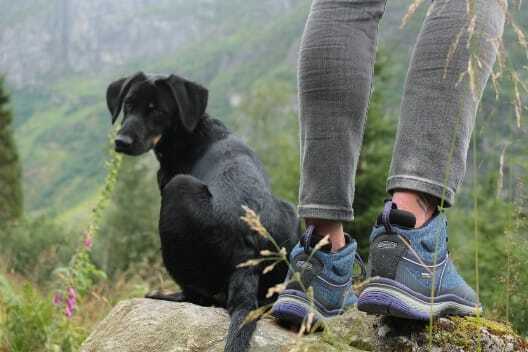 Our favourite shoes, the Terradora series, you can find either at your local KEEN retailer, or at Keenfootwear.com.